Mineral oil-base hydraulic oil. Meets and exceeds the requirementsof DIN 51 524 part 2 (HLP), ISO 6743/3 (HM) and AFNOR NF E48 602 (HM). Cleaning active EP hydraulic oil for extreme operating conditions. Meets and exceeds the requirements of DIN 51 524 part 2 (HLP, deterging) and MAN-N 698. 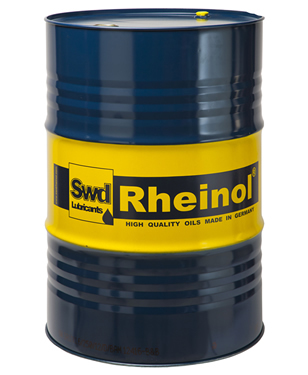 Swd Rheinol Hydralube HVLP - hydraulic fluids are pressure mediums, showing very good viscosity/temperature properties, based on mineral oil. The additivation improves the corrosion protection, the aging properties, and the wear protection, whereby the product meets and exceeds the requirements according DIN 51 524 Part 3. Readily biodegradable hydraulic oil HLP/HVLP on synthetic ester oil basis. Meets the minimum technical requirements for HEES oils of VDMA standard sheet 24 568 dated 03/1994 and the requirements placed on hydraulic oils HLP and HVLP of DIN 51 524 parts 2 & 3.